Arqiva to provide Al Jazeera with satellite and teleport distribution services. Gerrards Cross, UK, March 2016: Arqiva has been selected by Al Jazeera Media Network to provide its global teleport & satellite distribution services, with work having commenced in February of this year. 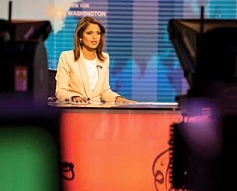 Over the course of a long-term agreement, Arqiva will distribute AJMN’s flagship news channels Al Jazeera Arabic and Al Jazeera English to popular global networks. The new agreement will allow Al Jazeera to offer its international audience a better viewing experience as the bit rate and video quality will increase. Viewers will also be able to enjoy the improved network resilience thanks to the use of dual and triplicate redundancy on key components of the core fibre, satellite and teleport design.